The sunshiny sweetness of fresh apricots is baked into every bite of this amazing cake! Just the thing with coffee or tea, its another wonderful recipe that incorporates the tradition of Greek baked fruits. This light, delicious cake showcases fresh apricots that are baked to sticky sweet golden perfection. You’ll end up eating quite a few fresh or baked apricots just on their own so make sure you get enough! You’ll need a bit over 2 lbs of fresh, medium apricots here. This comes out to between 10-12 pieces of fruit. And its fine if your apricots are a bit ripe, even over ripe or a little bruised. Baking is, thankfully, a very forgiving process! In the US, a quart container of fresh apricots from the farmers market will do the trick. 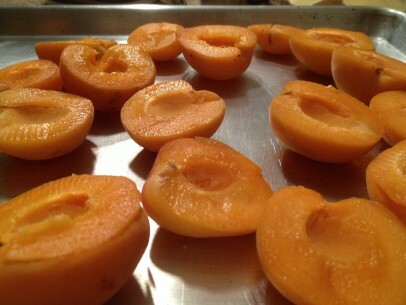 Cut the fresh apricots in half, remove the pit and arrange skin side down on a large flat baking sheet. I like to brush the tops with a bit of brandy or you can just use water if you prefer. Bake at 400 degrees for about 35 minutes or until they are very easily pierced with a fork. Let them cool until you can handle them and gently remove the skins. This is not as tedious as you may think honestly. 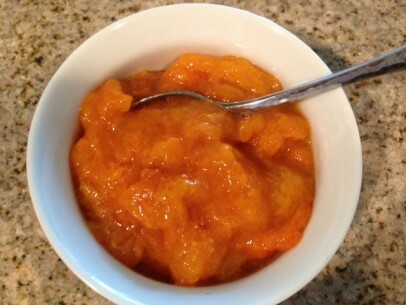 I like to cup the apricot half in the palm of my left hand and use a teaspoon to scoop the fruit from the skins. However you choose to do it, collect the baked fruit in a medium bowl and mash well. Feel free to leave your fruit a bit chunkier, its totally up to you. You can bake and mash your fresh apricots up to 2 days ahead. Just keep covered and refrigerated until ready to use. And its important, when you come to the cake ingredients, that you follow the liquid steps especially. Remember to first dissolve your sugar in the orange juice and THEN slowly add the vegetable oil. This simple sequence makes a huge difference in the way that these important ingredients incorporate or come together. When you next add the mashed apricots and finally the dry ingredients, you’ll end up with a creamy, thick, fight-for-the-spoon-to-lick batter! Just a note, this is a great recipe to make for church or school bake sales too. Just triple the recipe and you get 4 perfect loaf cakes. 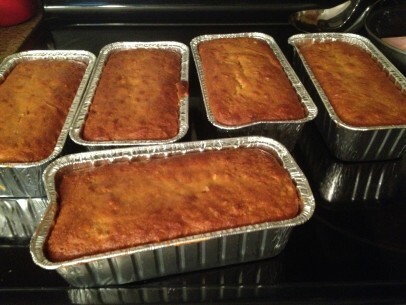 You can make them up to 4-5 days ahead or even keep baked loaves frozen for up to 2 months. A dusting of powdered sugar over the deep, golden brown top and they’re as lovely to eat as they are delicious to eat. Also a fantastic breakfast treat! 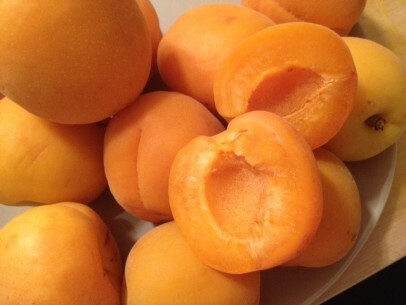 Cut fresh apricots in half and remove the pit. Arrange skin side down on a flat baking sheet. Lightly brush the tops of the apricots with brandy or water if you prefer. Bake at 400 degrees for 35 minutes. Allow to cool. Remove skins and mash fruit in medium bowl. Set aside. *This can be done up to 2 days ahead and kept covered in the refrigerator until ready to use. In a medium bowl, combine AP and almond flour, baking soda/baking powder, salt and mahlep. Mix well and set aside. In large bowl, add sugar and orange juice. stir until sugar is dissolved. Add ground cardamom, stir to combine and gradually add vegetable oil while stirring to incorporate well. Add mashed baked apricots. Mix well. In 2 parts, add flour mixture to liquids. Stir well to combine. If adding nuts, stir in at this point. Do not over mix the batter, just combine all ingredients completely. Check center with toothpick. Top should be a deep, golden brown color, cake should pull away from sides of pan and toothpick come out clean. Add another 5 minutes if needed. Allow cake to cool for at least 20 minutes in pan before removing and serving. This can be made up to 4 days ahead and kept, wrapped well and refrigerated. This cake is also nice dusted lightly with a little powdered sugar. Wonderful with coffee or tea and a treat for a weekend breakfast! And a very pretty plate to take to parties too – sliced and ready to go! party platter of apricot almond cake! 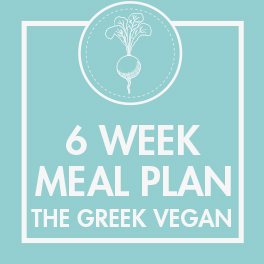 For more amazing Greek vegan recipes right to your inbox, check out our six-week meal plan! I would love to make this but apricots are not in season. Any substitues? Hi Maggie! Sorry not to get back to you sooner – crazy busy getting the calendar cookbook orders out these last couple of weeks! So I have used peaches before in this recipe with lovely results but they were fresh and not in season around here now (Boston, MA) – my best suggestion would be to substitue canned peaches, making sure the canning liquid is completely drained off, and I’m pretty sure it will be just as delightful as the fresh apricots. What is the name for this in Greek? Maybe there isn’t one, but I was curious! Really happy to find this recipe – we are in Cyprus and have a bumper crip of apricots, what a treat! I made this today! I couldn’t find fresh apricots, so I bought dried apricots instead and soaked them in water overnight. This morning, I boiled them in water for 20-30 minutes (I never really keep track of the time), then scooped them out of the water and pureed them in a blender. It turned out really well, so if any of you can’t get fresh apricots you can try this approach. I will try this cake with fresh apricots when I can get them. Thanks for posting, this is a wonderful recipe! Sounds yummy. I am the chef for our church vacation church camp. Want to bake this. What is and where to buy mahler? A greek spice? Winner, winner! Absolutely delicious. 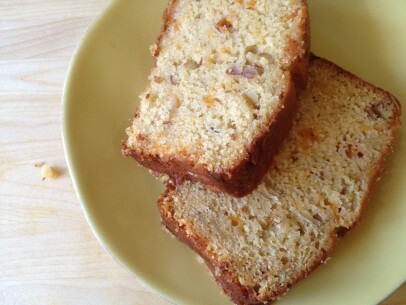 The loaf was amazingly moist and light (for a vegan loaf… Just like a regular loaf). 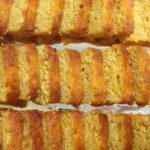 I just discovered your blog and am delighted by all the gorgeous recipes you have! Do you think this recipe would work with a walnut meal or something similar? My husband recently found out that almonds trigger his migraines, so we have had to cut them out of our diet, much to our dismay. I honestly don’t see why you couldn’t make the sub from almonds to walnuts. So sorry about the almond trigger! absolutely! just make sure they are finely ground and I would use blanched almonds which are simply almonds with the skins off 🙂 just give whole almonds a 15 second bath in boiling water, scoop them out into a clean dish towel and rub the brown skins off. Makes for a lighter almond flour and lighter/higher finished cake! This is the second time I’ve made this cake and it is outstanding. A real go-to recipe! – I even managed to find the mahlep at our local international food store. The flavour and texture is lovely. I did use tinned apricots both times though and was delicious. Thank you! Hi! This recipe sounds lovely except that I really can’t get on with cardamom. Is it ok to omit it whilst adding the mehlepi?